Mark joined Glynwood in 2018 as the Director of Finance & Operations. In this role, Mark is responsible for the fiscal health and smooth functioning of the organization through oversight of accounting and budgeting operations, creation and implementation of fiscal strategy and ensuring efficient operation of the farm. In this role he works across programs, property and fundraising, implementing processes and technologies to establish effective controls. 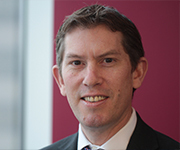 Prior to taking this role, Mark spent 25 years on Wall St running operations for JPMorgan in the UK, US and India and project managing teams building financial trading tools at Bloomberg LP. He took a two-year break early in his career to work as a chef in France and remains a passionate cook. Mark comes from a family of farmers and is himself a keen gardener, with a special interest in growing spicy peppers.